When was bacon invented? Historians tend to agree that bacon was invented c.700 BC and the first known use of bacon was during the Ancient Roman period of invention (600 BC - 400AD). The Romans combined the preservation processes of salting, curing and smoking pork, which prevented spoilage. Using these preservation processes the Romans ensured that ham kept for long periods of time, even in warm climates, and enabled them to transport meat over long distances across the Roman Empire. Definition of bacon: Bacon is defined as a relatively easy to produce and cheap meat source in which the back and sides of a pig or hog are salted and dried or smoked and usually sliced thin and then grilled or fried. Cuts of bacon: Bacon is made from the salted meat of a pig or hog. The cuts are 'streaky bacon' that is taken from the pork belly and 'back bacon' that is taken from the back of the pig with a lean oval piece of meat. Middle cuts are a long combination of streaky and back cuts. 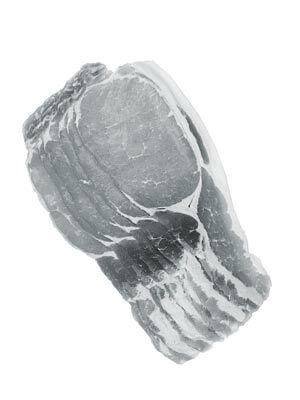 Collar bacon is taken from the back of a pig near the head. Italian Guanciale is a cured meat product prepared from pork jowl or cheeks. Fact 1: Who invented bacon? The name of the inventor of bacon is unknown but it is believed to have been invented in c.700 BC during the Ancient Roman era of inventions (600 BC - 400AD). Fact 2: Who invented bacon? The preservation of meat was critical to feed the people of the Roman Empire. Fresh meat was only available to the wealthiest men. Fact 3: Who invented bacon? The staple Roman diet required meat that had been subject to preservation methods to avoid spoilage. Preservation techniques ensured meat was available for long periods of time, especially in warm climates, and for transporting meat over long distances. The best and largest hams were imported to Rome from Gaul and Spain. Fact 4: Who invented bacon? The Romans discovered that salting or curing the meat was the best method of food preservation for conserving pork. Salting was the most basic and ancient form of preserving meat but resulted in making the meat dry and tough. Fact 5: Who invented bacon? The Romans discovered that by adding the fine white powder called saltpetre, aka potassium nitrate, to the preservation process required less salt which made the pork less dry and softer. It also gave the pork an attractive pink colour and transformed its flavour. Curing is therefore similar to salting, but curing involves the addition of the saltpetre nitrate. Fact 6: Who invented bacon? The Romans then added smoking techniques to the process as another natural preservative which gave their ham a characteristic, smoky flavor. The Romans produced their ham from the shoulder or leg of a hog that had been prepared by salting, curing and sometimes smoking. Fact 7: Who invented bacon? The Roman politician and historian Cato the Elder (234 BC – 149 BC) detailed various recipes used by the Romans to prepare hams. After the salting and curing process, which lasted over a period of 20 days, the meat was cleaned, greased with oil and then smoked. The ham was then greased with a mixture of olive oil and vinegar, two other items that were known to preserve foods. Fact 8: Who invented bacon? The Romans called their version of bacon "petaso" which was described in other recipes as salted and cured pork boiled with figs, then browned and seasoned with pepper sauce. Fact 9: Who invented bacon? The civilisations that followed the Romans through the Dark Ages and the Middle Ages and right up to the Industrial Revolution were also dependent on preserved meats, such as bacon and ham. Fact 10: Who invented bacon? The word 'bacon' originates from the from the Middle English word 'bacoun', a word used to commonly describe either smoked or salted pork. Other derivations of the word are the Old Dutch word "baken" or the Germanic word 'bakkon' meaning "back meat". Fact 11: Who invented bacon? It was important for the Medieval people of the Middle Ages, dominated by the feudal system, to preserve food on the manors and castles in the summer to be eaten during during the winter months. Fact 12: Who invented bacon? The Crusades saw the introduction of various spices from the east and many of these new spices were introduced into Medieval recipes for bacon to disguise the salty taste. Spices used included Pepper, Cloves, Garlic, Mace, Caraway and Mustard, many of which were served with a variety of sauces which also disguised the salt taste. Fact 13: Who invented bacon? The decline of the feudal system led to more people living in towns. Bacon was traditionally produced on local farms and prepared in the winter to provide meat for the family and to market in the towns. Fact 14: Who invented bacon? In England a whole side of bacon is called a 'Flitch' meaning the "salted and cured side of a hog". The word still survives due to an old tradition in a village situated in rural Essex, England in which a 'Dunmow Flitch' is awarded to a couple who had been married in church and remained 'unregreted' for a year and a day - hence the phrase "bringing home the bacon". Fact 15: Who invented bacon? Geoffrey Chaucer (1343 - 1400) alludes to the Dunmow Flitch trials in "The Wife of Bath's Tale" in the famous 14th century Canterbury Tales. The Flitch 'Trials' still take place in Great Dunmow every four years. Fact 16: Who invented bacon? The Elizabethan era heralded the Age of Discovery and the colonization of America. In 1539 Hernando de Soto introduced the first 13 pigs to America in Tampa Bay, Florida and pig production spread rapidly through the new colonies. Fact 17: Who invented bacon? In Britain a thin slice of bacon became known as a 'rasher' from a Middle English word meaning "rashly or hastily cooked". In America an individual slice of bacon was called a 'slice' or a 'strip' by the colonists and settlers. Fact 18: Who invented bacon? The Industrial Revolution witnessed the birth of new machinery and agricultural techniques that increased the supply of all meats including pork and bacon. In the 1800's the process of canning was invented by Nicolas Appert (1749 - 1841) that provided an additional form of preservation, but bacon was still the most popular of meats. Fact 19: Who invented bacon? In 1790 John Harris founded the first commercial bacon making company: in Wiltshire, England. By the mid 1800s the first pigs were commercially slaughtered in Cincinnati, which became known as "Porkopolis" and commercial cold storage facilities for pork were being built at harbors in both America and Europe. Sugar was introduced to curing process by some manufacturers as another form of preservative to reduce the salty taste of the bacon. Fact 20: Who invented bacon? During the 1800's a wet curing method was invented in Denmark using a combination of stitch pumping and curing the meat in curing tanks with a cover brine. The wet-curing process was less labour-intensive than the traditional dry-curing process of rubbing salt, spices and sugar into the bacon. Danish bacon began to be exported the Britain due to the growth in the UK population following the Industrial Revolution and remains popular to the modern day. Fact 21: Who invented bacon? The term 'Canadian Bacon' is a misnomer. The name dates to the 1800's and refers a time when there was a shortage of pork in Britain so the British imported pork from Canada. The meat was rolled in ground, yellow, split peas to help to preserve it, rather than smoking the bacon as was the British custom. In Canada the back cut is taken from the lean, boneless, pork loin. It is called "Peameal bacon" because the pork loin is cured by the process of pickling and rolled in a fine golden cornmeal. Fact 22: Who invented bacon? German immigrant, Oscar F. Mayer (1859–1955) introduced pre-sliced, pre-packaged bacon to the United States in 1924. Fact 23: Who invented bacon? The American manufacturing process of bacon led to various varieties of flavored bacons being introduced to the American market. Methods of smoking bacon with hickory, mesquite and apple wood produced different, distinctive tastes and flavourings such as chili pepper, molasses, maple, brown sugar and honey added to the variety of flavors.